With the cross-disciplinary development of MEMS technology, analytical chemistry, life sciences, electronics, informatics and so on, microfluidics technology has been in progess, which has been valued as one of the most important inventions affecting the human future. Blood is a very rare treasure, which has been widely used in clinic diagnoses, medicinal therapy, life sciences research etc. Blood is deemed so precious that is also called "red gold" because it can be sold for more than the cost of the same weight in gold. However the components of the blood is complicated, including cells, sub-cells, nucleic acid, protein, glucose, mineral ions, hormones, platelets and so on, which couldn’t be directly analyzed or used but need be pre-treated. Traditional sample pre-treatment techniques are usually performed manually, at lower integration, with time-consuming processes, and requiring large volumes of blood. The technologies of blood sample pre-treatment microfluidic chip could not only resolve the above problems of the traditional techniques, but also could potentially enable whole blood analyses for personal diagnoses and point-of-care detection. Furthermore, the technologies of blood sample pre-treatment chip could play an important role for the revolution of modern medicine. The group of Prof. Dafu Cui has begun to study MEMS technology and microfluidics. After more than ten years, various functional microfluidic chips such as blood separation chip, DNA chip, PCR chip, PDMS sandwich type electrophoresis chip have been developed and published in many famous international journals. As soon as “DNA extraction microfluidic chip integrated with porous matrix” was published, it was highly concerned and evaluated by the French and American experts. “Whole blood sample pre-treatment integrated microfluidic chip” has been cited so many times after it was published, which was highly valued as “This is a significant step toward a true “lab on a chip” where multiple steps are combined into a single device”. Blood sample pre-treatment microfluidic chip and its technology is on the rise, which is far from universal. The authors reviewed a large amount of literature, and combined ten years of the group’s research work to write the eBook with rich, full of examples. The readers will get a comprehensive understanding of this new technology, and also be provided the reference value for their research work. Furthermore the blood sample pre-treatment microfluidic chip technology will be promoted and further developed in the future. The Microfabrication technology has stimulated a plurality of lab-on-a-chip research for biomedical researchers and health care practitioners to manipulate and analyze complex biological fluids at the nano and microliter scale. Specifically, various miniaturized diagnostic devices have been developed for blood sample detection, which can increase diagnostic capacity significantly by enabling rapid, point-of-care chemical analysis. Recently, more and more researchers are paying attention to on-chip whole blood sample pretreatment, which is the focus of this eBook, aiming to form real Micro Total Analysis Systems (uTAS) for whole blood analysis by integrating blood sample pre-treatment and detection together. The eBook consists of six chapters. Chapter 1 gives a brief introduction on the background of whole blood and the concept of µTAS, followed by a summary of specific microfluidic chips for whole blood pretreatment. Chapter 2 firstly reviews microfluidic chips for plasma isolation from whole blood samples with various methodologies (i.e., microfiltration, microcentrifugation, ultrasound, Zweifach–Fung effect and capillary effect). Then two examples using the plasma skimming effect and crossflow filtration respectively are discussed in detail. Chapter 3 firstly reviews microfluidic devices for blood cell filtrating, sorting and collection. Sorting methods such as size filtration, optical and magnetic manipulation, affinity separation, dielectrophoretic manipulation are covered and compared. Then a case study using crossflow filtration is analyzed in detail. Chapter 4 firstly reviews reported microfluidic devices for blood cell lysis in which mechanical lysis, sonication lysis, thermal lysis, electrical lysis, chemical lysis and optical lysis are covered. And then a cell lysis microchip using chemical agents for cell lysis is chosen as an example for further concept demonstration. Chapter 5 firstly reviews microfluidic devices for DNA extraction and purification by comparing reported methods of solid phase extraction, solid phase reversible immobilization and liquid/liquid extraction. And then two microchips with different solid phase matrixes are used for demonstration of chip based DNA extraction. 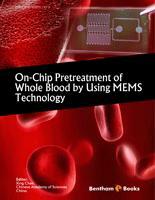 Chapter 6 firstly reviews current integrated microfluidic platforms for blood pretreatment, followed by a case study. Both fundamental analysis and specific applications are presented in this eBook, which is written for researchers, engineers, and advanced students who have research interest in whole blood pretreatment and miniaturized techniques. We would like to express our appreciation to Bentham Science Publishers and their team members.